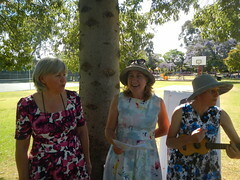 Members of Our Urban Village met in Joslin Reserve on Saturday 30 November to celebrate the achievements of 2013 and mark the end of the year. Food, drink, conversation and music were shared by those present. Our Urban Village is a project of four Community Groups of Sustainable Communities in Norwood Payneham & St Peters. Our area extends from Hackney Road to Glynde and from the River Torrens to Payneham Road. We are developing our local economy, using local essential services and building community networks.